Bangkok is a weird town. A pit stop for many travelers on their way to some tropical paradise or ready to catch a long flight back, it is definitely not an A-side destination. Sights are few and far between and, frankly, walking is more a pain than a pleasure. Still, just as the relentless heat dehydrates you and the pollution poisons your lungs, the city will grow on you if you let it. It’s easy to write about Kao San Road, Wat Pho, MBK or a cruise in the Chao Praya River. They look good in pictures, and who cares about what a pain it can be to get to or from these sights. Instead, here are some of the images, sounds and smells that have come to made me feel at home away from home and to which, really, I can only hope to go back sooner than later. Streetfood: Anywhere, anytime. Better or worse. It’s busy, convenient, tasting from good to delicious. And competitive: when staying in soi 18, I remember noticing cooked food stalls closing at 1.30 am….and then opening as early as 10 am. 2. Shopping malls – a necessary break from the heat, the noise, the pollution, the puddles after a rainstorm. Great places to eat cheap Thai food – I’m thinking Terminal 21 and Gateway Ekkamai, the two I’ve frequented the most. 3. Nightlife scenes on or around Sukhumvit and its sois. Whatever you think of the naughty scene, however much you use it, abuse it or suffer it. I’ve written about people watching in this area here. But it gets crazier. Take a few steps North and you’ll be in Soi Arab, packed with Middle-Eastern tourists and expats patronizing Middle-Eastern restaurants, travel agents and money exchangers. No – I never fail to get a quick shish-taouk en route to some watering hole. 4. Quiet temples in the middle of the busiest shopping districts. Yes – no matter where, there’s always a temple ready-to-hand where you can sit, meditate or -more prosaically- go through your photos of your holiday. Always, everywhere. In a taxi on the way to Talat Rot Fai. Trying to escape the city by bus. There are options. Hire a motorcycle taxi and cheat the traffic, yet the hair-rising ride will make you lose a couple of years of your life. 6. The skytrain with its stunning views of the city and ridiculously cold air-con. Another prime venue for people watching. 7. The rooftop bars, high above the streets. It’s cooler, the air cleaner and and the views breathtaking. Bangkok is full of skyscrapers and hence there is no shortage of skybars. This is the city of angels, after all. 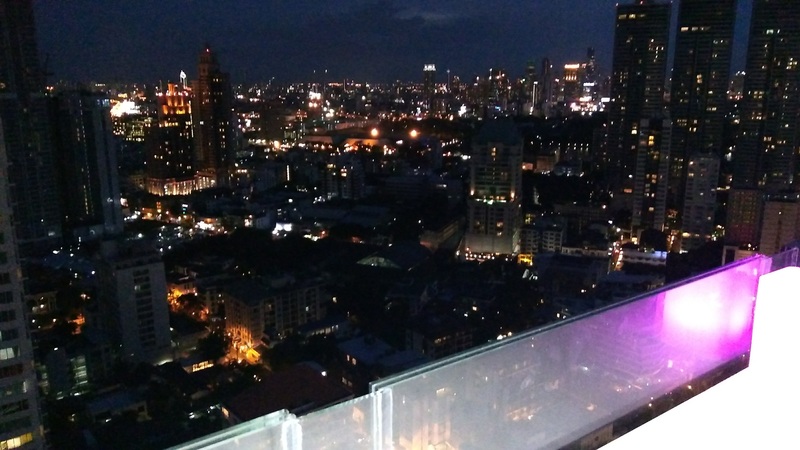 Amazing city views from the male restroom in Above Eleven Skybar, Sukhumvit soi 11.